This one falls in the "Sometimes, ya just gotta laugh" category. The sheer desperation of the nuclear cheerleaders, advocates, and true nut-jobs is getting pretty funny. This time it is the claim by a self-styled nuclear expert that government regulations have wrongly increased nuclear power plant costs by a factor of TEN. He claims, apparently with a straight face, that if only the government would get out of it, nuclear power plants would be built for only ten percent of the present, hyper-inflated costs. He shall remain nameless here, unless circumstances change. He writes prolifically, and amusingly enough on several venues. Knowing this claim to be absolute rubbish, I spent a bit of time exploring the bits of the internet that might have some actual, published data on the costs of component bits that make up a nuclear power plant. It seems that the nuclear cheerleaders just won't accept my word, even though that word is based on substantial education and decades of long, hard and pertinent experience in process plants and power plants world-wide. So, a bit of hopefully objective data is presented below, with the source. as a percent of total installed cost for six different plants in different countries: Czech Republic, Germany, France, USA, UK, and Mexico. Average plant size is 1,260 MWe. The average of the six nuclear plants is 13.8 percent for just the turbine and generator. 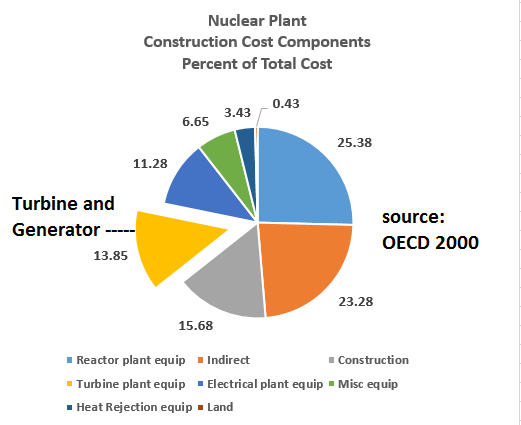 See Figure 1 at right for nuclear power plant cost breakdown, using average of costs for the six plants in the OECD paper above. It would be difficult, then, to see how removing or relaxing regulations would allow one to build an entire nuclear plant at 10 percent of present cost, when buying just the steam turbine and generator will cost more than that. One would rapidly run out of money for the other major systems: nuclear reactor and associated equipment to generate steam, electrical plant for transforming and distribution, heat rejection equipment (cooling tower, heat exchangers, pumps and their motors), and miscellaneous equipment. • Improved procurement, organisation and contractual aspects. • Standardisation and construction in series. • Regulatory and policy reform. Ah, well. The nuclear power cheerleaders' desperation increases. This one is pretty funny, though. Building a modern, pressurized-water reactor of 1,200 MWe or greater for one-tenth the present cost.